George Graham Reviews Sonny landreth's "From the Reach"
The music world is rife with musicians who seem to be better known by famous artists than by the general public. While they often work in supporting roles, they also maintain solo careers. This week we have a first-rate album by one of those people, who also calls on some of the well-known names he has supported to join him on his CD. It's Sonny Landreth, whose new ninth release is called From the Reach. Born in 1951 in Mississippi, Sonny Landreth moved at an early age to Louisiana, and he has long been associated with the state's music scene, known for his slide guitar, blues and so-called "swamp rock." He has been "discovered" several times by some of the music world's household names, including John Mayall, in whose 1990 CD Landreth was a guest. He worked extensively as a studio musician, recording with, among others, John Hiatt and Jimmy Buffett. He has also performed live with Bonnie Raitt, Mark Knopfler, Buddy Guy, and Gov't Mule to name a few. He was also the opening act for Eric Clapton's Crossroads Festival in 2007. Landreth's own solo recording career goes back to the early 1980s, and picked up momentum in the 1990s. His last two CD releases were live recordings. From the Reach features guest appearances by a number of his musical fellow-travelers, including Eric Clapton, Mark Knopfler, and Jimmy Buffett, plus blues and jazz guitarist Robben Ford, country artist Vince Gill, Texas guitar whiz Eric Johnson, and Dr. John on piano and vocals. It's an impressive guest list, but it's also the sort of thing that risks being one of those musically lightweight show-biz exercises in star-studding. Fortunately, it does not turn out that way. It's very much Landreth's album, and the luminaries' contributions are more in the way of support, rather than an attempt to wave around their star power. Landreth also appears with a his regular, and very competent band that includes Steve Conn on keyboards, David Ranson on bass and Michael Burch on drums, among others. Landreth says that while he had long wanted to do a recording with some of the people he describes as among his favorite artists, he specifically wanted to avoid its becoming a "duets" album. So instead, he decided to write tunes with the specific guest star in mind. The result is an organic mixture, that still emphasizes Landreth's own eclectic but bluesy sound, established on his previous recordings. Being so much associated with Louisiana, Hurricane Katrina and its effect on New Orleans and the state play a part in some of the songs. From the Reach the new CD from veteran Louisiana guitarist Sonny Landreth is one of those rock guitar fan's delights, that not only spotlights Landreth's great guitar work, it also brings him into the company of some of his many friends, of various musical stripes. There's a lot of hot guitar playing to be heard, not only from Landreth but from Eric Clapton, Eric Johnson, Robben Ford and even Vince Gill, but the quality of the writing, including the lyrics is also very high. Our grade for sound quality is close to an "A." There is good clarity, the guitar sounds are given interesting sonic colors, and the mix has everything in the right place. But everything is compressed to be loud almost all the time, nullifying whatever dynamic range the music had. 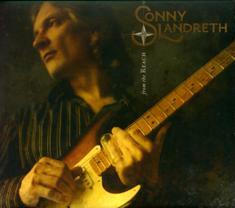 Sonny Landreth said he thought about the CD's odd title for a long time. He says that the word "reach" can also refer to a body of water, so the title was intended to convey both meanings of the word as a connection or quest, reaching out to the other musicians who appeared, and as a reference to the geography of Louisiana and how it was affected by Katrina. In both respects, Landreth succeeded.